Bronzer side is standard good decent product however the highlighter side is gorgeous. It has an iridescent pink shift. Lasted all day. Creamy powder. Love! Good value for its price. It's a great bronzer/highlighter combo that's very easy to work with and the results are beautiful. The packaging is also very cute and compact, making it an easy item to have on the go. This smells great, very light on my skin and adds just the perfect glow to my face. I'm quite a tan person but this just makes my skin look a little more tan and I love it. Definitely recommend this product. Great product for travel because is very compact and the packaging is really good. 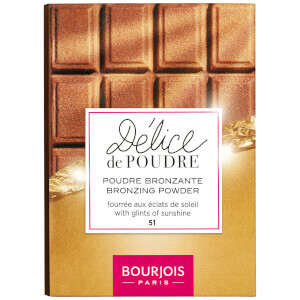 I like this product, the bronzer is great to contour or just bronze up the skin. The highlighter isn't crazy pigmented which i really like. this was my first purchase from lookfantastic. Reasonable price, good product! I strongly recommend. The powder is very good, even though the colour is not that intense and you should apply a bit extra to see a result. I didn't like the highlighter - I didn't see any difference before and after application. The product smells great! I think this is a nice product! The packaging is very pretty. The bronzer has a nice texture, and is great to use to contour and to just bronze up your skin. The highlighter is not as pigmented like some others, but great to use on an everyday basis. It smells great!!! not those sweet chocolate scent but something like toasted cocoa? bronzer is not over pigmented which is good, highlighter is a bit pinkish based I'll say... not over shimmery, not highlighting my pores... overall, good! Smells nice not too strong. I wanted a glowing highlighter but it's not that strong and shimmery. The bronzer is good, has a bit orange on it which I don't like but it's not too bad. I like the package and the product for daily use.